Same store Yum sales in China will decline in the fourth quarter. Shares of Yum Brands dropped more than 10% Friday, a day after the company said it expects sales at restaurants in China to fall in the fourth quarter. Sales at existing locations in China will drop by 4% in the quarter, the Kentucky-based company said. Last year, sales grew by 21% -- a difficult performance to replicate. China is an increasingly important market for the parent company of Taco Bell, KFC and Pizza Hut, which has placed big bets on future growth in the world's second largest economy. 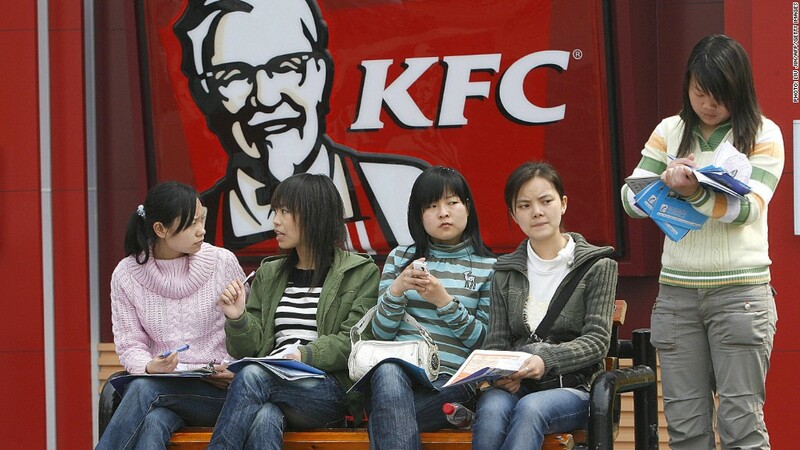 The company operates more than 4,000 KFC restaurants in China, and around 750 Pizza Huts. It plans to open hundreds more. Yum (YUM) CEO David Novak said the fast food purveyor is making up for the disappointing sales. "Stronger than expected operating performance from Yum! Restaurants International and our U.S. division is offsetting softer sales in China," he said in a statement. The slack sales might be attributable to macro conditions in China, where the government reported gross domestic product growth of 7.4% in the most recent quarter -- a number that disappointed analysts. Since then, early data points to stronger expansion in coming quarters -- but too late for Yum's fourth quarter figures. "Next year will be another strong year for our China division, given this year's record development of at least 800 new units," Novak said. Yum isn't the only company to feel the pinch of a slowing China economy though. Fast food rival McDonald's has a big presence in China as well. McDonald's reported earlier this month that same-store sales around the globe fell in October, led by a decline in key Asian markets such as China and Japan. Shares of McDonald's (MCD) were down slightly early Friday.